Fogo the Mercenary chief: 何この変わりよう! Chief Inspector K. Jasper considered the stone relic and the blood that covered it. He understood why the town guard of Trinsic had wanted his help. This was the third collector of mystical artifacts who had been killed in the last week. This clearly was not a coincidence. While the fresh blood was obviously from the relic’s final owner, Jasper didn’t know what to make of the strange occult symbols covering the stone mosaic. It appeared to be a fragment of a crypt wall, but which one? Jasper made a note to speak to someone at the Lycaeum. He started reading the victim’s notes on the collection. Most of the baubles and trinkets had pages of lore and history, but the victim’s research on this particular relic was missing. There was just a scrap of paper with a single name written on it: Leoric Gathenwale. The name immediately brought the details of the case to mind: the madness, the rituals, and the monstrous spider. ・The new quest & caddellite crafting will be activated manually following each shard being published. Please be patient as we work through each shard. ・The Treasures of Khaldun, Trick or Treating, Pumpkin Patches, and Zombie Skeletons will not be active until October 1st. ・The classic Keep design has been adjusted to accommodate current and planned changes. Please review the notes for more details. ・A 21st Anniversary Gift Bag will be given to all veteran characters who are at least 30 days old logging in between Saturday, September 1, 2018 12:01:00 AM GMT-04:00 (ET) and Monday, October 1, 2018 11:59:00 PM GMT-04:00 (ET). ・Collectibles available from the “Personal Study” of some of Britannia’s most notable characters, with a rare chance from your character’s personal study! ・The Orrery can be activated and deactivated by double clicking. ・The Orrery can be dyed with a metallic dyetub, natural dyes, and promotional dyes. ・The telescope allows viewing the night sky! ・Telescopes can be used to view constellations and other celestial objects. ・Constellations can be charted using the Cartography Mapmaker’s Pen to create a star chart. ・Constellations can be named via the star chart. ・A star chart can be turned into Willebrord the Astronomer at the Moonglow Telescope Astronomer’s Tent. Players that are the first to discover a constellation will have their discovery logged in the constellation ledger and be given a special title and recipe. ・All constellations are shard unique. There are 1,000 constellations to discover. ・Visit the Astronomer’s tent at the Moonglow Telescope to learn more about the origins of Britannian Astronomy and how to use the telescope. ・Origin, Baja, and Izumo Only – constellations, their associated coordinates, and the constellation ledger have been reset for WW release. Players who submitted constellations will be able keep to the rewards they received. Caddellite raw materials can be harvested in The Lost Lands with special Caddellite infused harvesting tools for sale by an NPC vendor outside Khaldun. ・First Aid Belt -this blessed belt container safely holds up to 1000 bandages, offers 50% weight reduction, and 10% bandage healing bonus while equipped that stacks with other healing bonuses. Felucca Only – during the duration of the Treasures of Khaldun, 4 of the 6 (or 8 of the 12 with justice) powerscrolls created will be guaranteed 120 level scrolls. The remaining scrolls have a random chance as they would normally. Scrolls from the Khal Ankur champ spawn will be shard bound. ・The 2017 iteration of Treasures of Halloween at the Sorcerer’s Dungeon turn-in vendor will accept Artifacts of Enchanted Origin and continue to dispense rewards until the 2019 iteration of Treasures of Halloween. This vendor will dispense the same rewards it did during the 2017 iteration of the event. ・The 2018 iteration of Treasures of Halloween at Khaldun turn-in vendor will only accept Artifacts of the Cult that have been received from Khaldun. ・New designs have been added to the house placement tool and as options house conversion. You can see the winning designs for Publish 101 here and read more about the conversion process here. ・The East, North, and West indentations on the castle footprint are now impassable. ・The South indentation is still passable. ・Players will be able to lock items down from inside the house in all these areas (not under the house sign). 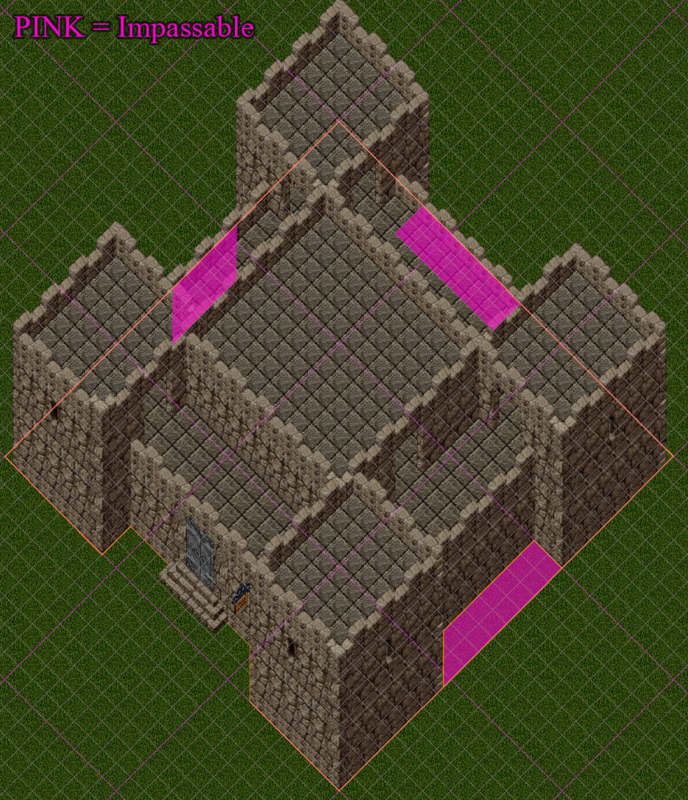 ・The pink areas are newly impassable areas around the classic Keep. ・Enhanced Client – Fixed issue with Vendor context menu options not triggering. ・Classic Client – Fixed issue with crashing when entering house customization. ・Fixed issue where the “add party” action was available on certain mobs in Khaldun. ・Fixed issue where the EC bandage macro would not work while bandages were inside the First Aid Belt. ・Khaldun Tasty Treats will now display duration on the buff icon and no longer send additional system messages when renewing. ・The first aid belt will no longer be blessed if claimed on Siege. ・There are now 1,000 constellations to discover. ・Based on player feedack, the amount of points available from creatures killed in dungeon Khaldun has been increased. This will increase the overall chances at receiving an Artifact of the Cult. ・Fixed issue where vengeful spirits could chase players outside of Khaldun. ・Based on player feedback, the Enhance Potions property on the Khal Ankur ・・・Mask/Pendant has been set to 35%. ・Based on player feedback, the hue on the gem bag found in hidden and puzzle chests in Khaldun will match the chest. ・Fixed issue where resources spawned inside hidden and puzzle chests would not stack with other resources of the same type. ・Based on player feedback, the first aid belt can now be dyed with specialty pigments and has +2 Hit Point Regen. ・Mage armor has been added to the Pendant of Khal Ankur artifact. ・Powerscrolls awarded during the months of October & November at the Khal Ankur champ spawn will be Shard Bound. This applies to the Khal Ankur champ spawn only. ・Fixed issue where creatures in Khaldun would not attack player when equipping certain items. ・Decreased the chance for obtaining a rough meteorite from Caddellite harvesting. ・Fixed issue where Khal Ankur level 4 champ spawn mobs would spawn with erroneously high hit points. ・A copy of Willebrord’s Astronomy book will now be included when the telescope is claimed through the 21st Anniversary Token. ・Khal Ankur will now taunt his attackers while under the effects of his guardian generals. ・Fixed issue where the Constellation Ledger could stop functioning after server up. ・Only weapons created as “Of the Cult” artifacts will be caddellite infused. ・Revenants should no longer chase players outside Khaldun. ・Added taint, dreadmare mane, and corruption to the bag of gems that can spawn inside hidden puzzle chests. ・Swapped arrows and bolts with invisibility potions that can spawn inside hidden puzzle chests. ・Increased the likelihood of finding premium rewards in hidden and puzzle chests. ・Added spellchanneling to Caddellite harvesting tools. ・Khal Ankur will now change hue when preparing his meteor attack so that players in the EC who filter particles will have warning. ・Added ability to harvest caddellite ore in Khaldun dungeon. ・The Orrery can now be used while locked down. This will only apply to newly created Orreries that are claimed via the 21st anniversary token. ・Willebrord the Astronomer will no longer accept star charts that do not have a name. Blanks can no longer be set as constellation names. ・The first aid belt can now be dyed with a regular dyetub. ・An issue where hidden chests in Khaldun would not respawn has been resolved and will no longer erroneously become puzzle boxes. ・There is now a 100% chance of success when polishing rough meteorites to create a polished meteorite. The drop rate of rough meteorites has been reduced. ・An issue which caused some puzzleboxes to be unable to be looted has been resolved. ・The Khal Ankur mask/pendant meteor breath ability will now function against Khaldun creatures. Note caddellite weapons/spellbooks/instruments are still required to damage khaldun creatures. ・Fixed issue where erroneous tool failure messages would be sent when using the caddellite harvesting tools. ・Fixed issue where certain areas of the camp crafting area would not function properly. ・Fixed issue where certain generals would not be attackable during the Khal Ankur fight. ・Fixed issue where Khaldun tasty treats could not be refreshed while a pet was already under the effect. ・Khaldun tasty treats now have a different hue when successfully crafted. It's that time of year again! As Ultima Online approaches another milestone in gaming history, celebrating 21 amazing years, the UO Team wants to extend a very special thank you to all our players for the years of continued support! Your devotion is what keeps us motivated each day to make Britannia as living and vibrant a world as ever. So again, thank you and long live UO! If everything goes as planned we will be publishing Origin, Baja, and Izumo with Publish 101 during normal maintenance cycles for those shards on Thursday September 13, 2018. We want to extend a special thank you to all those who participated in our play sessions and provided very valuable feedback! There were many entries for the Castle/Keep contest, and this has only served to underscore the creativity of our amazing community. These new designs will be prefabricated, so you will not be able to alter them once they are placed. The house will cost per tile such as the old prefab houses do. This is the first of many contests to come, and we fully expected this to be a fluid process as we refine best practices for future publishes. Based on feedback we will be adjusting the process for Publish 102. We are going to set up two rounds of voting to help cull the number of entries so the community can more easily assist in choosing their favorite designs. We will also be refining the teleporting process to cut down on waiting times and speed up your ability to visit each entry. As we outlined from the beginning, entries that do not meet our aesthetic and functional requirements will not be taken into consideration. We know this can be a completely subjective requirement and will do our best to try and outline some tips for future contents, as this is something we are continually evaluating as we push the limits of the community's creativity. We want to thank everyone who participated in the inaugural run of the contest and look forward to the contest for Publish 102! Congratulations to all the winners of the first contest. We look forward to seeing the next creative batch of designs! With all the excitement around the Castle & Keep contest don't forget to check out Publish 101 which is full of exciting new content to play in the coming weeks! Read the full details about Publish 101 below and see if you are brave enough to chase the Treasures of Khaldun! Publish 101 - The Treasures of Khaldun & More! ・21st Anniversary Rewards - new collectibles including the introduction of Astronomy! ・Treasures of Khaldun - A quest, crafting, monster bashing, rewards, and stealable loot all in one! Are you brave enough to face Khal Ankur? ・Trick or Treat? New treats to be had from Britannia's shopkeepers & citizens alike! ・Jack o' Lanterns - the fields are alive again with Grimms and Butchers with all new designs! ・Skeletons - Unfortunate enough to perish? Beware of Zombie skeletons in the cemeteries! 1. Can we get a countdown added to certain buffs, like those for Alacrity scrolls? Yes, this is something we can add for a future publish. 2. Can you add dinosaur bones to the Huntmaster's Challenge? While bones don't necessarily fit thematically with the Huntmaster's Challenge we have some updates planned in Publish 102 to the Huntmaster's Challenge, but think this would be great addition to the Valley of Eodon - look for this in a future publish! 3. Can you add rounded versions of various floor tiles to the house customization system so they fit under rounded walls? This would be a very large art task, as those tiles would need to be hand drawn for all existing floor sets and unfortunately isn't a high priority at this time. 4. Can you add client options to improve performance such as disabling various screen effects, draw distance restrictions, and house loading options? We are constantly looking to improve performance in both clients and providing players the ability to control visual effects based on their systems. In Publish 101 we added a toggle to disable flying animations for all flying creatures such as gargoyles and dragons. We hope to add more of these options, as well as introduce optimizations for the future. 5. Can you add additional macro functionality to the Classic Client? This is something we are excited to release in Publish 102, especially the much requested dress/undress macro! For October we will be on Sonoma on October 1st at 9pm ET. ・ Asukaシャード - 日本時間9月17日（月）10:00 p.m.
We are pleased to announce that Publish 101 will be available on Origin, Baja, and Izumo beginning on September 13, 2018 with each shard’s regularly scheduled maintenance. Be sure to check the notes for full release details. As always, we look forward to your feedback. Again we want to thank everyone who participated in our public play sessions and provided valuable feedback for Publish 101 - we couldn’t have done it without you! ・The Going Gumshoe Introductory Quest. You will see this quest displayed in the Town Cryer, however the associated NPCs will not be available until after Publish 101 is deployed World Wide. ・Trammel & Felucca Khal Ankur champ spawn. You will be able to visit the Felucca entrance to Khaldun, however, you will not be able to damage any of the creatures from the champ spawn, nor will you accumulate points towards Halloween Artifact drops. There were many entries for the Castle/Keep contest, and this has only served to underscore the creativity of our amazing community. These new designs will be prefabricated, so you will not be able to alter them once they are placed. The house will cost per tile such as the old prefab houses do. This is the first of many contests to come, and we fully expected this to be a fluid process as we refine best practices for future publishes. Based on feedback we will be adjusting the process for Publish 102. We are going to set up two rounds of voting to help cull the number of entries so the community can more easily assist in choosing their favorite designs. We will also be refining the teleporting process to cut down on waiting times and speed up your ability to visit each entry. As we outlined from the beginning, entries that do not meet our aesthetic and functional requirements will not be taken into consideration. We know this can be a completely subjective requirement and will do our best to try and outline some tips for future contents, as this is something we are continually evaluating as we push the limits of the community’s creativity. We want to thank everyone who participated in the inaugural run of the contest and look forward to the contest for Publish 102! Please note, that when converting existing homes to the new designs, you will not see a preview of the design you have chosen. You will be presented with a confirmation gump and a system message specifying which design you are trying to convert to, so be sure to double check your selection! There is a mandatory client patch associated with this release. Make sure you patch up your client before trying to access all shards. Character transfer is disabled from Origin, Baja, and Izumo until Publish 101 has been deployed world wide. ・Swapped lock picks with invisibility potions that can spawn inside hidden puzzle chests. The following issues have been resolved as of the latest TC1 publish ? huge thank you to everyone who has taken an early look at Publish 101 and provided amazing feedback! Want to add a bit of variety to your vanity mount collection? This majestic creature hails from mysterious origins and uses its attractive tail feathers to show off its beauty! The look of this creature was heavily inspired by one of our Japanese players, Eowyn. We hope you appreciate beautiful birds as much as Eowyn. Get your Eowmu from the Ultima Store today! The latest update to Publish 101 has been released to TC1. You can read about the latest changes here. We also look forward to your feedback which you can share on the forums. We will also be hosting a public play session tomorrow (9/5/2018) beginning at noon ET. Copy your crafters over to TC1 and supply those valiant enough to stand against the armies of Khaldun! We expect the play session to last for several hours as we go through Caddellite resource gathering, crafting, and the champ spawn ? so hop on and say hello!